Snapdragon 845 full specs and features revealed! 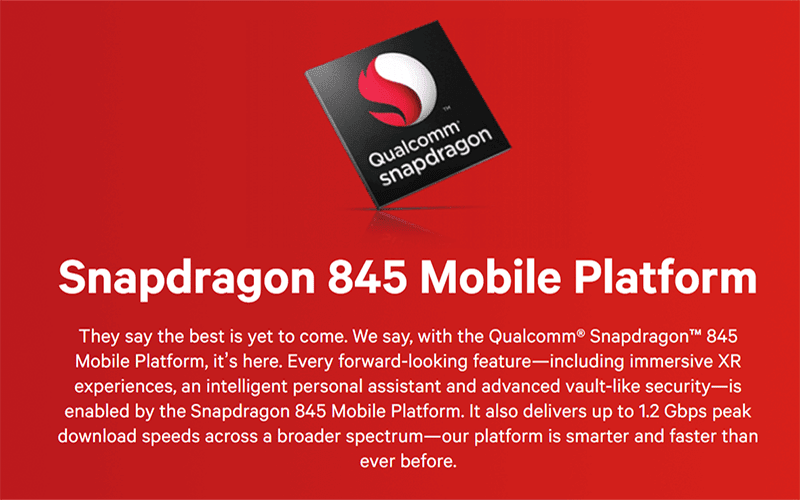 Home / mobile / news / qualcomm / Snapdragon 845 full specs and features revealed! Qualcomm has recently launched their greatest mobile chip yet in Hawaii, the Snapdragon 845 built under the 10-nanometer (nm) LPP FinFET process technology. The Snapdragon 845 now features immersive XR experiences, intelligent personal assistant and advanced vault-like security, and up to 1.2 Gbps LTE peak download speeds. On top of that, Qualcomm also claims that the 64-bit Snapdragon 845 octa-core processor is now faster and smarter than ever. It uses Kryo 385 CPU w/ four performance cores up to 2.8GHz or 25% speedier performance than Snapdragon 835. It's paired w/ another four efficiency cores w/ up to 1.8GHz clock speed. Other than that, the Snapdragon 845 Mobile Platform has a Qualcomm Spectra 280 ISP to deliver premium camera and XR experience w/ up to 60 images per second capture on a 16MP sensor. It also has support for up to 16MP dual camera setup and up to 32MP single camera module. The Snapdragon 845 also boasts the new Adreno 630 Visual Processing Subsystem which has 30% improvement in graphics or video rendering compared to the previous generation. Qualcomm is also joining Apple and Huawei w/ the A.I. craze. The Snapdraogn 845 boasts a 3rd Generation Qualcomm Hexagon 685 DSP to support on-device AI processing, delivering richer camera, voice, XR and gaming experiences. It also has Qualcomm Secure Processing Unit to protect personal data, X20 Modem and WiFi for fiber-optic speeds, and Qualcomm Quick Charge 4+ technology w/ up to 50% charge in 15 minutes. Let's expect to see the Snapdragon 845 on Samsung, Sony, and Xiaomi phones first this coming Q1 2018.